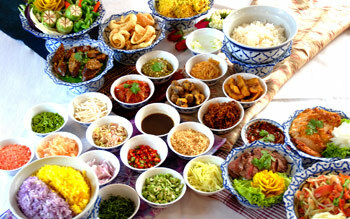 Thai & European classic menus recommended! The Art-Nouveau style Benjamas Restaurant has been serving international specialties for guests from all over the world all year round. 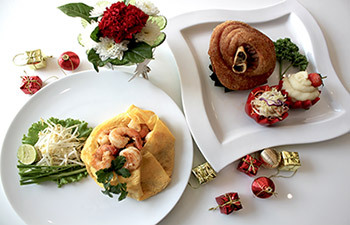 Now our expert chef proudly presents the popular ‘Pad Thai”, stir fried rice noodle with shrimps and the crunchy German ‘deep fried pork knuckle with mushroom sauce’ for a tasty dining. 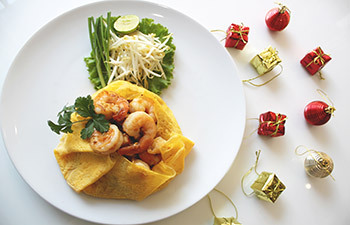 Stir Fried Rice Noodle with Shrimps or Pad Thai is one of the most popular street dishes in Thailand. However, at Benjamas it is cooked with high quality ingredients and sauce that makes the signature noodle dish is our best one not to be missed. 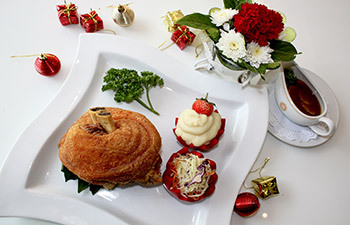 A super crispy and tasty pork knuckle served with mashed potato and coleslaw is a highly pleasing to the senses. Have it with mushroom sauce to feel classic German taste or with seafood sauce for spicy lovers. Forget about calories and let’s try it out!! 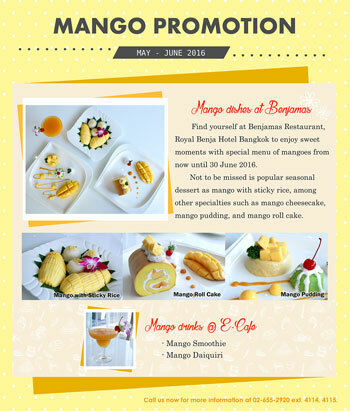 Benjamas Restaurant, Royal Benja Hotel Bangkok is making this summer even more colorful with “Ripe Mango Promotion” presented in variety of desserts such as mango with sticky rice, mango roll cake, mango cheesecake, and mango pudding. By the way, do not miss to taste the unique flavor of mango at E-Café with mango smoothie and mango daiquiri. Promotion is offered from now until 30 June 2016 at the price starting from 90 baht. Keep cool during hot season with “Khao Chae”, the royal Thai cuisine with jasmine rice soaking in cool water and served with different side dishes for classic summer treat such as deep-fried shrimp paste balls, shredded beef and pork with sweet sauce, fried snakehead fish, stir fried pickle turnip with egg and stuffed peppers at Benjamas Restaurant in lunch buffet from 11.30 a.m.- 2.30 p.m. during 1-15 April 2019. 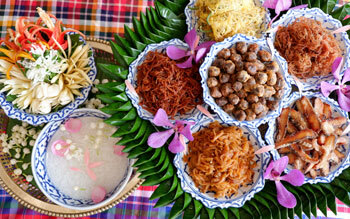 Once a year for authentic Thai food from 4 regions on Songkran Day, 13 April 2015, as Benjamas Restaurant, Royal Benja Hotel Bangkok presents popular dishes from northern, central, north-eastern and southern parts of Thailand, with delectable spicy items in lunch buffet from 11:00 a.m.- 2:30 p.m., at the cost of 400 baht. Turn your lazy afternoon into an inspired moment with healthy smoothies at E-café. 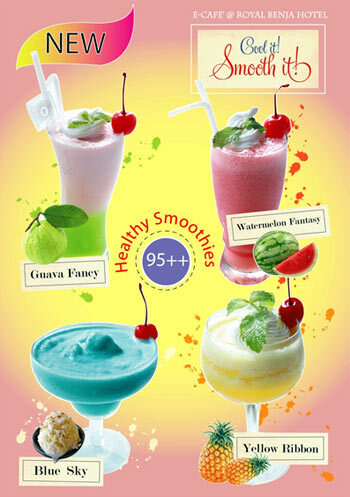 Find 4 perfect refreshments, guava fancy, watermelon fantasy, blue sky and yellow ribbon at THB 95++/ glass.